QGIS supports various capabilities for editing OGR, SpatiaLite, PostGIS, MSSQL Spatial and Oracle Spatial vector layers and tables. The procedure for editing GRASS layers is different - see section Digitizing and editing a GRASS vector layer for details. This version of QGIS does not track if somebody else is editing a feature at the same time as you are. The last person to save their edits wins. Before we can edit vertices, we must set the snapping tolerance and search radius to a value that allows us an optimal editing of the vector layer geometries. A general, project-wide snapping tolerance can be defined by choosing Settings ‣ Options. On Mac, go to QGIS ‣ Preferences.... On Linux: Edit ‣ Options. In the Digitizing tab, you can select between ‘to vertex’, ‘to segment’ or ‘to vertex and segment’ as default snap mode. You can also define a default snapping tolerance and a search radius for vertex edits. The tolerance can be set either in map units or in pixels. The advantage of choosing pixels is that the snapping tolerance doesn’t have to be changed after zoom operations. In our small digitizing project (working with the Alaska dataset), we define the snapping units in feet. Your results may vary, but something on the order of 300 ft at a scale of 1:10000 should be a reasonable setting. A layer-based snapping tolerance can be defined by choosing Settings ‣ (or File ‣) Snapping options... to enable and adjust snapping mode and tolerance on a layer basis (see figure_edit_1 ). Note that this layer-based snapping overrides the global snapping option set in the Digitizing tab. So, if you need to edit one layer and snap its vertices to another layer, then enable snapping only on the snap to layer, then decrease the global snapping tolerance to a smaller value. Furthermore, snapping will never occur to a layer that is not checked in the snapping options dialog, regardless of the global snapping tolerance. So be sure to mark the checkbox for those layers that you need to snap to. The Snapping options enables you to make a quick and simple general setting for all layers in the project so that the pointer snaps to all existing vertices and/or segments when using the ‘All layers’ snapping mode. In most cases it is sufficient to use this snapping mode. It is important to consider that the per-layer tolerance in ‘map units’ was actually in layer units. So if working with a layer in WGS84 reprojected to UTM, setting tolerance to 1 map unit (i.e. 1 meter) wouldn’t work correctly because the units would be actually degrees. So now the ‘map units’ has been relabeled to ‘layer units’ and the new entry ‘map units’ operates with units of the map view. While working with ‘on-the-fly’ CRS transformation it is now possible to use a snapping tolerance that refers to either the units of the reprojected layer (setting ‘layer units’) or the units of the map view (setting ‘map units’). Search radius is the distance QGIS uses to search for the closest vertex you are trying to move when you click on the map. If you aren’t within the search radius, QGIS won’t find and select any vertex for editing, and it will pop up an annoying warning to that effect. Snap tolerance and search radius are set in map units or pixels, so you may find you need to experiment to get them set right. If you specify too big of a tolerance, QGIS may snap to the wrong vertex, especially if you are dealing with a large number of vertices in close proximity. Set search radius too small, and it won’t find anything to move. The search radius for vertex edits in layer units can be defined in the Digitizing tab under Settings ‣ Options. This is the same place where you define the general, project- wide snapping tolerance. Before editing a layer, you should zoom in to your area of interest. This avoids waiting while all the vertex markers are rendered across the entire layer. Apart from using the pan and zoom-in / zoom-out icons on the toolbar with the mouse, navigating can also be done with the mouse wheel, spacebar and the arrow keys. While digitizing, you can press the mouse wheel to pan inside of the main window, and you can roll the mouse wheel to zoom in and out on the map. For zooming, place the mouse cursor inside the map area and roll it forward (away from you) to zoom in and backwards (towards you) to zoom out. The mouse cursor position will be the center of the zoomed area of interest. You can customize the behavior of the mouse wheel zoom using the Map tools tab under the Settings ‣ Options menu. Panning the map during digitizing is possible with the arrow keys. Place the mouse cursor inside the map area, and click on the right arrow key to pan east, left arrow key to pan west, up arrow key to pan north, and down arrow key to pan south. You can also use the space bar to temporarily cause mouse movements to pan the map. The PgUp and PgDown keys on your keyboard will cause the map display to zoom in or out without interrupting your digitizing session. Besides layer-based snapping options, you can also define topological functionalities in the Snapping options... dialog in the Settings (or File) menu. Here, you can define Enable topological editing, and/or for polygon layers, you can activate the column Avoid Int., which avoids intersection of new polygons. The option Enable topological editing is for editing and maintaining common boundaries in polygon mosaics. QGIS ‘detects’ a shared boundary in a polygon mosaic, so you only have to move the vertex once, and QGIS will take care of updating the other boundary. The second topological option in the Avoid Int. column, called Avoid intersections of new polygons, avoids overlaps in polygon mosaics. It is for quicker digitizing of adjacent polygons. If you already have one polygon, it is possible with this option to digitize the second one such that both intersect, and QGIS then cuts the second polygon to the common boundary. The advantage is that you don’t have to digitize all vertices of the common boundary. Another option is to use Enable snapping on intersection. It allows you to snap on an intersection of background layers, even if there’s no vertex on the intersection. By default, QGIS loads layers read-only. This is a safeguard to avoid accidentally editing a layer if there is a slip of the mouse. However, you can choose to edit any layer as long as the data provider supports it, and the underlying data source is writable (i.e., its files are not read-only). All editing sessions start by choosing the Toggle editing option. This can be found in the context menu after right clicking on the legend entry for a given layer. Alternatively, you can use the Toggle Editing Toggle editing button from the digitizing toolbar to start or stop the editing mode. Once the layer is in edit mode, markers will appear at the vertices, and additional tool buttons on the editing toolbar will become available. Remember to Save Layer Edits regularly. This will also check that your data source can accept all the changes. 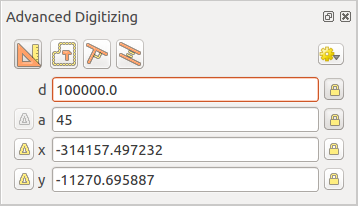 You can use the Add Feature, Add Feature or Add Feature icons on the toolbar to put the QGIS cursor into digitizing mode. For each feature, you first digitize the geometry, then enter its attributes. To digitize the geometry, left-click on the map area to create the first point of your new feature. For lines and polygons, keep on left-clicking for each additional point you wish to capture. When you have finished adding points, right-click anywhere on the map area to confirm you have finished entering the geometry of that feature. The attribute window will appear, allowing you to enter the information for the new feature. 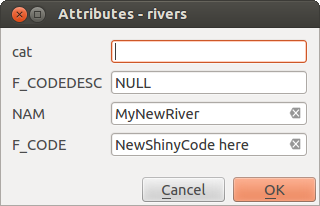 Figure_edit_2 shows setting attributes for a fictitious new river in Alaska. In the Digitizing menu under the Settings ‣ Options menu, you can also activate Suppress attributes pop-up windows after each created feature and Reuse last entered attribute values. With the Move Feature(s) icon on the toolbar, you can move existing features. For editing, the attribute types are validated during entry. Because of this, it is not possible to enter a number into a text column in the dialog Enter Attribute Values or vice versa. If you need to do so, you should edit the attributes in a second step within the Attribute table dialog. This feature allows the digitization of multiple layers. Choose Save for Selected Layers to save all changes you made in multiple layers. You also have the opportunity to Rollback for Selected Layers, so that the digitization may be withdrawn for all selected layers. If you want to stop editing the selected layers, Cancel for Selected Layer(s) is an easy way. The same functions are available for editing all layers of the project. For shapefile-based layers as well as SpatialLite, PostgreSQL/PostGIS, MSSQL Spatial, and Oracle Spatial tables, the Node Tool provides manipulation capabilities of feature vertices similar to CAD programs. It is possible to simply select multiple vertices at once and to move, add or delete them altogether. The node tool also works with ‘on the fly’ projection turned on, and it supports the topological editing feature. This tool is, unlike other tools in QGIS, persistent, so when some operation is done, selection stays active for this feature and tool. If the node tool is unable to find any features, a warning will be displayed. It is important to set the property Settings ‣ Options ‣ Digitizing ‣ Search Radius: to a number greater than zero (i.e., 10). Otherwise, QGIS will not be able to tell which vertex is being edited. The current version of QGIS supports three kinds of vertex markers: ‘Semi-transparent circle’, ‘Cross’ and ‘None’. To change the marker style, choose Options from the Settings menu, click on the Digitizing tab and select the appropriate entry. Start by activating the Node Tool and selecting a feature by clicking on it. Red boxes will appear at each vertex of this feature. Selecting vertices: You can select vertices by clicking on them one at a time, by clicking on an edge to select the vertices at both ends, or by clicking and dragging a rectangle around some vertices. When a vertex is selected, its color changes to blue. To add more vertices to the current selection, hold down the Ctrl key while clicking. Hold down Ctrl or Shift when clicking to toggle the selection state of vertices (vertices that are currently unselected will be selected as usual, but also vertices that are already selected will become unselected). Adding vertices: To add a vertex, simply double click near an edge and a new vertex will appear on the edge near to the cursor. Note that the vertex will appear on the edge, not at the cursor position; therefore, it should be moved if necessary. Deleting vertices: After selecting vertices for deletion, click the Delete key. Note that you cannot use the Node Tool to delete a complete feature; QGIS will ensure it retains the minimum number of vertices for the feature type you are working on. To delete a complete feature use the Delete Selected tool. Moving vertices: Select all the vertices you want to move. Click on a selected vertex or edge and drag in the direction you wish to move. All the selected vertices will move together. If snapping is enabled, the whole selection can jump to the nearest vertex or line. Each change made with the node tool is stored as a separate entry in the Undo dialog. Remember that all operations support topological editing when this is turned on. On-the-fly projection is also supported, and the node tool provides tooltips to identify a vertex by hovering the pointer over it. Selected features can be cut, copied and pasted between layers in the same QGIS project, as long as destination layers are set to Toggle editing beforehand. Features can also be pasted to external applications as text. That is, the features are represented in CSV format, with the geometry data appearing in the OGC Well-Known Text (WKT) format. However, in this version of QGIS, text features from outside QGIS cannot be pasted to a layer within QGIS. When would the copy and paste function come in handy? Well, it turns out that you can edit more than one layer at a time and copy/paste features between layers. Why would we want to do this? Say we need to do some work on a new layer but only need one or two lakes, not the 5,000 on our big_lakes layer. We can create a new layer and use copy/paste to plop the needed lakes into it. What happens if the source and target layers have different schemas (field names and types are not the same)? QGIS populates what matches and ignores the rest. If you don’t care about the attributes being copied to the target layer, it doesn’t matter how you design the fields and data types. If you want to make sure everything - the feature and its attributes - gets copied, make sure the schemas match. If your source and destination layers use the same projection, then the pasted features will have geometry identical to the source layer. However, if the destination layer is a different projection, then QGIS cannot guarantee the geometry is identical. This is simply because there are small rounding-off errors involved when converting between projections. If you have created a new column in your attribute table with type ‘string’ and want to paste values from another attribute column that has a greater length the length of the column size will be extended to the same amount. This is because the GDAL Shapefile driver starting with GDAL/OGR 1.10 knows to auto-extend string and integer fields to dynamically accomodate for the length of the data to be inserted. If we want to delete an entire polygon, we can do that by first selecting the polygon using the regular Select Single Feature tool. 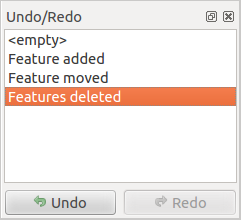 You can select multiple features for deletion. Once you have the selection set, use the Delete Selected tool to delete the features. The Cut Features tool on the digitizing toolbar can also be used to delete features. This effectively deletes the feature but also places it on a “spatial clipboard”. So, we cut the feature to delete. We could then use the Paste Features tool to put it back, giving us a one-level undo capability. Cut, copy, and paste work on the currently selected features, meaning we can operate on more than one at a time. When a layer is in editing mode, any changes remain in the memory of QGIS. Therefore, they are not committed/saved immediately to the data source or disk. If you want to save edits to the current layer but want to continue editing without leaving the editing mode, you can click the Save Layer Edits button. When you turn editing mode off with Toggle editing (or quit QGIS for that matter), you are also asked if you want to save your changes or discard them. If the changes cannot be saved (e.g., disk full, or the attributes have values that are out of range), the QGIS in-memory state is preserved. This allows you to adjust your edits and try again. It is always a good idea to back up your data source before you start editing. While the authors of QGIS have made every effort to preserve the integrity of your data, we offer no warranty in this regard. The Undo and Redo tools allows you to undo or redo vector editing operations. There is also a dockable widget, which shows all operations in the undo/redo history (see Figure_edit_3). This widget is not displayed by default; it can be displayed by right clicking on the toolbar and activating the Undo/Redo checkbox. Undo/Redo is however active, even if the widget is not displayed. When Undo is hit, the state of all features and attributes are reverted to the state before the reverted operation happened. Changes other than normal vector editing operations (for example, changes done by a plugin), may or may not be reverted, depending on how the changes were performed. To use the undo/redo history widget, simply click to select an operation in the history list. All features will be reverted to the state they were in after the selected operation. Use Rotate Feature(s) to rotate one or multiple features in the map canvas. Press the Rotate Feature(s) icon and then click on the feature to rotate. Either click on the map to place the rotated feature or enter an angle in the user input widget. If you want to rotate several features, they shall be selected first. If you enable the map tool with feature(s) selected, its (their) centroid appears and will be the rotation anchor point. If you want to move the anchor point, hold the Ctrl button and click on the map to place it. If you hold Shift before clicking on the map, the rotation will be done in 45 degree steps, which can be modified afterwards in the user input widget. The Simplify Feature tool allows you to reduce the number of vertices of a feature, as long as the geometry doesn’t change. With the tool you can also simplify multi-part features. First, drag a rectangle over the feature. The vertices will be highlighted in red while the color of the feature will change and a dialog where you can define a tolerance in map units or pixels will appear. QGIS calculates the amount of vertices that can be deleted while maintaining the geometry using the given tolerance. The higher the tolerance is the more vertices can be deleted. After gaining the statistics about the simplification just klick the OK button. The tolerance you used will be saved when leaving a project or when leaving an edit session. So you can go back to the same tolerance the next time when simplifying a feature. You can create ring polygons using the Add Ring icon in the toolbar. This means that inside an existing area, it is possible to digitize further polygons that will occur as a ‘hole’, so only the area between the boundaries of the outer and inner polygons remains as a ring polygon. You can add part polygons to a selected multipolygon. The new part polygon must be digitized outside the selected multi-polygon. You can use the Fill Ring function to add a ring to a polygon and add a new feature to the layer at the same time. Thus you need not first use the Add Ring icon and then the Add feature function anymore. The Delete Ring tool allows you to delete ring polygons inside an existing area. This tool only works with polygon layers. It doesn’t change anything when it is used on the outer ring of the polygon. This tool can be used on polygon and multi-polygon features. Before you select the vertices of a ring, adjust the vertex edit tolerance. The Delete Part tool allows you to delete parts from multifeatures (e.g., to delete polygons from a multi-polygon feature). It won’t delete the last part of the feature; this last part will stay untouched. This tool works with all multi-part geometries: point, line and polygon. Before you select the vertices of a part, adjust the vertex edit tolerance. You can reshape line and polygon features using the Reshape Features icon on the toolbar. It replaces the line or polygon part from the first to the last intersection with the original line. With polygons, this can sometimes lead to unintended results. It is mainly useful to replace smaller parts of a polygon, not for major overhauls, and the reshape line is not allowed to cross several polygon rings, as this would generate an invalid polygon. For example, you can edit the boundary of a polygon with this tool. First, click in the inner area of the polygon next to the point where you want to add a new vertex. Then, cross the boundary and add the vertices outside the polygon. To finish, right-click in the inner area of the polygon. The tool will automatically add a node where the new line crosses the border. It is also possible to remove part of the area from the polygon, starting the new line outside the polygon, adding vertices inside, and ending the line outside the polygon with a right click. The reshape tool may alter the starting position of a polygon ring or a closed line. So, the point that is represented ‘twice’ will not be the same any more. This may not be a problem for most applications, but it is something to consider. The Offset Curve tool creates parallel shifts of line layers. The tool can be applied to the edited layer (the geometries are modified) or also to background layers (in which case it creates copies of the lines / rings and adds them to the the edited layer). It is thus ideally suited for the creation of distance line layers. The displacement is shown at the bottom left of the taskbar. To create a shift of a line layer, you must first go into editing mode and activate the Offset Curve tool. Then click on a feature to shift it. Move the mouse and click where wanted or enter the desired distance in the user input widget. Your changes may then be saved with the|mActionSaveEdits|:sup: Save Layer Edits tool. QGIS options dialog (Digitizing tab then Curve offset tools section) allows you to configure some parameters like Join style, Quadrant segments, Miter limit. You can split features using the Split Features icon on the toolbar. Just draw a line across the feature you want to split. In QGIS 2.0 it is now possible to split the parts of a multi part feature so that the number of parts is increased. Just draw a line across the part you want to split using the Split Parts icon. The Merge Selected Features tool allows you to merge features. A new dialog will allow you to choose which value to choose between each selected features or select a function (Minimum, Maximum, Median, Sum, Skip Attribute) to use for each column. If features don’t have a common boundaries, a multipolygon will be created. The Merge Attributes of Selected Features tool allows you to merge attributes of features with common boundaries and attributes without merging their boundaries. First, select several features at once. Then press the Merge Attributes of Selected Features button. 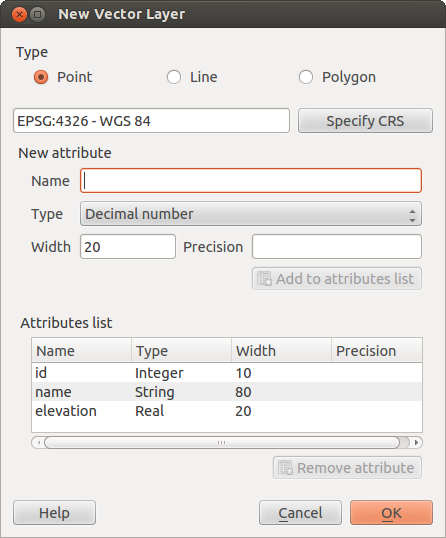 Now QGIS asks you which attributes are to be applied to all selected objects. As a result, all selected objects have the same attribute entries. Rotate Point Symbols allows you to change the rotation of point symbols in the map canvas. You must first define a rotation column from the attribute table of the point layer in the Advanced menu of the Style menu of the Layer Properties. Also, you will need to go into the ‘SVG marker’ and choose Data defined properties .... Activate Angle and choose ‘rotation’ as field. Without these settings, the tool is inactive. To change the rotation, select a point feature in the map canvas and rotate it, holding the left mouse button pressed. 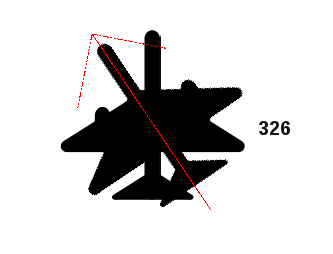 A red arrow with the rotation value will be visualized (see Figure_edit_4). When you release the left mouse button again, the value will be updated in the attribute table. If you hold the Ctrl key pressed, the rotation will be done in 15 degree steps. When capturing new geometries or geometry parts you also have the possibility to use the Advanced Digitizing panel. You can digitize lines exactly parallel or at a specific angle or lock lines to specific angles. Furthermore you can enter coordinates directly so that you can make a precise definition for your new geomtry. The tools are not enabled if the map view is in geographic coordinates. QGIS allows you to create new shapefile layers, new SpatiaLite layers, new GPX layers and New Temporary Scratch Layers. Creation of a new GRASS layer is supported within the GRASS plugin. Please refer to section Creating a new GRASS vector layer for more information on creating GRASS vector layers. To create a new shape layer for editing, choose New ‣ New Shapefile Layer... from the Layer menu. The New Vector Layer dialog will be displayed as shown in Figure_edit_5. Choose the type of layer (point, line or polygon) and the CRS (coordinate reference system). To complete the creation of the new shapefile layer, add the desired attributes by clicking on the [Add to attributes list] button and specifying a name and type for the attribute. A first ‘id’ column is added as default but can be removed, if not wanted. Only Type: real , Type: integer , Type: string and Type:date attributes are supported. Additionally and according to the attribute type, you can also define the width and precision of the new attribute column. Once you are happy with the attributes, click [OK] and provide a name for the shapefile. QGIS will automatically add a .shp extension to the name you specify. Once the layer has been created, it will be added to the map, and you can edit it in the same way as described in section Digitizing an existing layer above. To create a new SpatiaLite layer for editing, choose New ‣ New SpatiaLite Layer... from the Layer menu. The New SpatiaLite Layer dialog will be displayed as shown in Figure_edit_6. To define an attribute table for the new SpatiaLite layer, add the names of the attribute columns you want to create with the corresponding column type, and click on the [Add to attribute list] button. Once you are happy with the attributes, click [OK]. QGIS will automatically add the new layer to the legend, and you can edit it in the same way as described in section Digitizing an existing layer above. When this plugin is loaded, choose New ‣ Create new GPX Layer... from the Layer menu. In the Save new GPX file as dialog, you can choose where to save the new GPX layer. Empty, editable memory layers can be defined using Layer ‣ Create Layer ‣ New Temporary Scratch Layer. Here you can even create Multipoint, Multiline and Multipolygon Layers beneath Point, Line and Polygon Layers. Temporary Scratch Layers are not saved and will be discarded when QGIS is closed. See also paste_into_layer . The attribute table displays features of a selected layer. Each row in the table represents one map feature, and each column contains a particular piece of information about the feature. Features in the table can be searched, selected, moved or even edited. To open the attribute table for a vector layer, make the layer active by clicking on it in the map legend area. Then, from the main Layer menu, choose Open Attribute Table. It is also possible to right click on the layer and choose Open Attribute Table from the drop-down menu, and to click on the Open Attribute Table button in the Attributes toolbar. This will open a new window that displays the feature attributes for the layer (figure_attributes_1). The number of features and the number of selected features are shown in the attribute table title. Each selected row in the attribute table displays the attributes of a selected feature in the layer. If the set of features selected in the main window is changed, the selection is also updated in the attribute table. Likewise, if the set of rows selected in the attribute table is changed, the set of features selected in the main window will be updated. Rows can be selected by clicking on the row number on the left side of the row. Multiple rows can be marked by holding the Ctrl key. A continuous selection can be made by holding the Shift key and clicking on several row headers on the left side of the rows. All rows between the current cursor position and the clicked row are selected. Moving the cursor position in the attribute table, by clicking a cell in the table, does not change the row selection. Changing the selection in the main canvas does not move the cursor position in the attribute table. The table can be sorted by any column, by clicking on the column header. A small arrow indicates the sort order (downward pointing means descending values from the top row down, upward pointing means ascending values from the top row down). For a simple search by attributes on only one column, choose the Column filter ‣ from the menu in the bottom left corner. Select the field (column) on which the search should be performed from the drop-down menu, and hit the [Apply] button. Then, only the matching features are shown in the attribute table. Here you can also use the Function list ‣ Recent (Selection) to make a selection that you used before. The expression builder remembers the last 20 used expressions. The matching rows will be selected, and the total number of matching rows will appear in the title bar of the attribute table, as well as in the status bar of the main window. For searches that display only selected features on the map, use the Query Builder described in section Query Builder. To show selected records only, use Show Selected Features from the menu at the bottom left. as shown in figure_attributes_1 . Below these buttons is the Field Calculator bar, which allows calculations to be quickly applied attributes visible in the table. This bar uses the same expressions as the Field Calculator (see Field Calculator). If you want to use attribute data in external programs (such as Excel), use the Copy selected rows to clipboard button. You can copy the information without vector geometries if you deactivate Settings ‣ Options ‣ Data sources menu Copy geometry in WKT representation from attribute table. The selected features can be saved as any OGR-supported vector format and also transformed into another coordinate reference system (CRS). Just open the right mouse menu of the layer and click on Save as to define the name of the output file, its format and CRS (see section Map Legend). To save the selection ensure that the Save only selected features is selected. It is also possible to specify OGR creation options within the dialog. Features that are on the clipboard may be pasted into a new layer. To do this, first make a layer editable. Select some features, copy them to the clipboard, and then paste them into a new layer using Edit ‣ Paste Features as and choosing New vector layer or New memory layer. This applies to features selected and copied within QGIS and also to features from another source defined using well-known text (WKT). 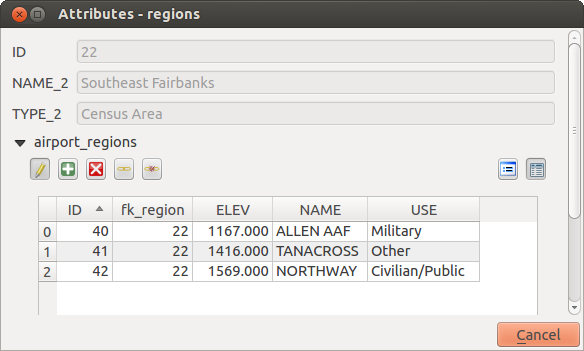 QGIS allows you also to load non-spatial tables. This currently includes tables supported by OGR and delimited text, as well as the PostgreSQL, MSSQL and Oracle provider. The tables can be used for field lookups or just generally browsed and edited using the table view. When you load the table, you will see it in the legend field. It can be opened with the Open Attribute Table tool and is then editable like any other layer attribute table. As an example, you can use columns of the non-spatial table to define attribute values, or a range of values that are allowed, to be added to a specific vector layer during digitizing. Have a closer look at the edit widget in section Fields Menu to find out more. Relations are a technique often used in databases. The concept is, that features (rows) of different layers (tables) can belong to each other. As an example you have a layer with all regions of alaska (polygon) which provides some attributes about its name and region type and a unique id (which acts as primary key). Then you get another point layer or table with information about airports that are located in the regions and you also want to keep track of these. If you want to add them to the region layer, you need to create a one to many relation using foreign keys, because there are several airports in most regions. In addition to the already existing attributes in the airports attribute table another field fk_region which acts as a foreign key (if you have a database, you will probably want to define a constraint on it). This field fk_region will always contain an id of a region. It can be seen like a pointer to the region it belongs to. And you can design a custom edit form for the editing and QGIS takes care about the setup. 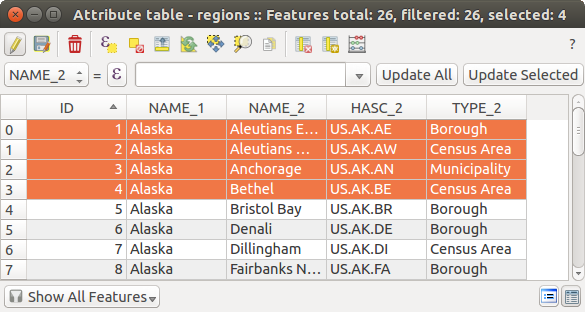 It works with different providers (so you can also use it with shape and csv files) and all you have to do is to tell QGIS the relations between your tables. QGIS makes no difference between a table and a vector layer. Basically, a vector layer is a table with a geometry. So can add your table as a vector layer. To demostrate you can load the ‘region’ shapefile (with geometries) and the ‘airport’ csv table (without geometries) and a foreign key (fk_region) to the layer region. This means, that each airport belongs to exactly one region while each region can have any number of airports (a typical one to many relation). 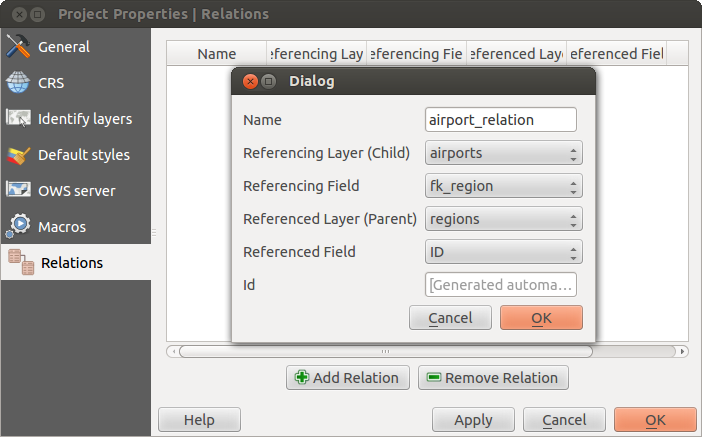 The first thing we are going to do is to let QGIS know about the relations between the layer. This is done in Settings ‣ Project Properties. Open the Relations menu and click on Add. name is going to be used as a title. It should be a human readable string, describing, what the relation is used for. We will just call say “Airports” in this case. id will be used for internal purposes and has to be unique. You may need it to build custom forms once this is supported. If you leave it empty, one will be generated for you but you can assign one yourself to get one that is easier to handle. 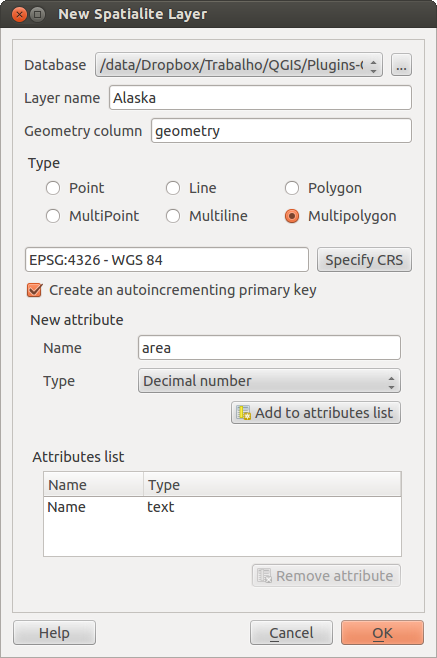 Now that QGIS knows about the relation, it will be used to improve the forms it generates. As we did not change the default form method (autogenerated) it will just add a new widget in our form. So let’s select the layer region in the legend and use the identify tool. Depending on your settings, the form might open directly or you will have to choose to open it in the identification dialog under actions. The button is for toggling the edit mode. Be aware that it toggles the edit mode of the airport layer, although we are in the feature form of a feature from the region layer. But the table is representing features of the airport layer. The button will add a new feature to the airport layer. And it will assign the new airport to the current region by default. The button will delete the selected airport permanently. The symbol will open a new dialog where you can select any existing airport which will then be assigned to the current region. This may be handy if you created the airport on the wrong region by accident. The symbol will unlink the selected airport from the current region, leaving them unassigned (the foreign key is set to NULL) effectively. The two buttons to the right switch between table view and form view where the later let’s you view all the airports in their respective form. If you work on the airport table, a new widget type is available which lets you embed the feature form of the referenced region on the feature form of the airports. It can be used when you open the layer properties of the airports table, switch to the Fields menu and change the widget type of the foreign key field ‘fk_region’ to Relation Reference. 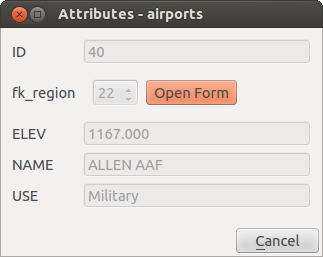 If you look at the feature dialog now, you will see, that the form of the region is embedded inside the airports form and will even have a combobox, which allows you to assign the current airport to another region.